A new, eco-friendly, electric boat hire service has been established on the Regent’s Canal in London, UK, stretching from Paddington in the west to Limehouse in the east of the city. Entitled GoBoat, the venture originally made its debut in Copenhagen, Denmark before establishing itself, via licensees, in Australia and the UK. Grant Sweeney, co-founder of GoBoat, tells Ship & Boat International: “The fleet has recently expanded from eight to 10 boats and we anticipate another two more will join the line-up in the summer.” Each boat can be booked by a group of up to eight persons, with weekday hire rates in the range of £59 (US$79) for one hour and £209 (US$280) for six hours per group, increasing by about £20 (US$27) for each period on the weekend.The vessels are designed with seating around a central table, which can be used for picnicking, and children and pets are welcome on board. GoBoat adheres to a ‘green’ operational ethos in both outfitting its fleet with pure electric engines and incorporating recycled plastic and sustainably sourced wood into each boat’s build. These materials account for approximately 80% of each boat, the company estimates. The vessels are constructed by Rand Boats in Denmark and are loosely based on Rand’s Picnic 18 open day cruiser design – albeit with reduced power and operational complexity. The vessels are also designed to be straightforward to use and require no license to operate. “The only requirement is that the driver must be at least 18 years of age,” Sweeney confirms. “Each driver is given an in-depth tutorial at the commencement of their hire period, so they can safely and confidently navigate the canal.” To guarantee passenger safety, each boat has been equipped with lifejackets for each occupant, a life buoy, a throw rope, an air horn, oars and a fire extinguisher. 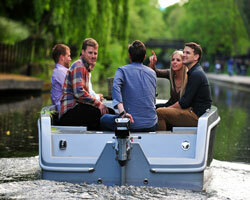 GoBoat’s entire Regent’s Canal fleet is powered by Torqeedo’s electric engine solutions, with each boat having been fitted with a single, low-powered and tiller-controlled version of the Torqeedo Cruise 2.0 motor. Torqeedo estimates: “The Cruise 2.0 has a range of approximately 30km when going slowly, or approximately 15km at full throttle”. However, GoBoat’s vessels are intended to travel at 3.5knots on the canal, so “full throttle” operations do not really apply to this particular fleet. In addition to the obvious benefits of ensuring relatively cheap, pollution-free operations, especially when compared to petrol-fuelled boats, Sweeney says: “[The Cruise 2.0 engines] are really quiet, meaning that people can enjoy their trip along the canals without having to talk over the sound of an engine.” This feature should also create minimal disturbance to the canal’s cluster of houseboats.